The chapter’s spring 2017 program took us, once again, to the San Francisco Peninsula, this time to explore two works of Frank Lloyd Wright. 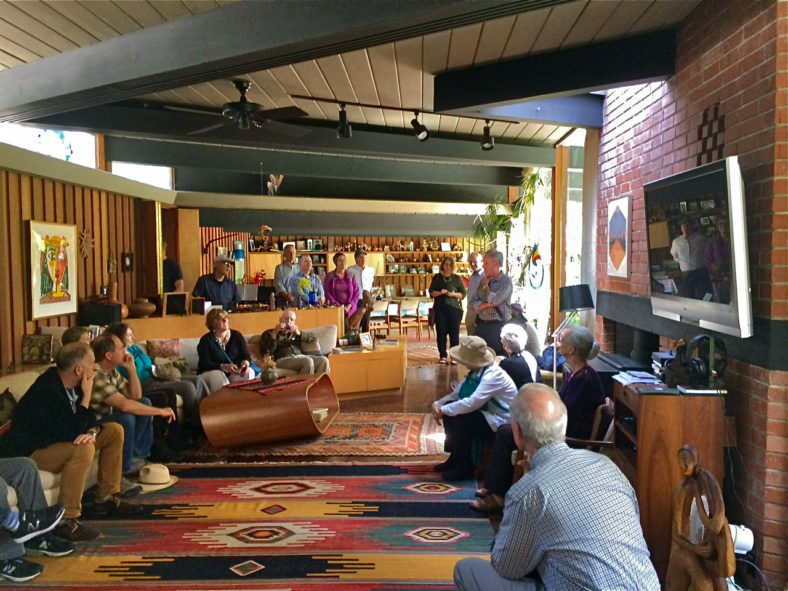 Impetus for this tour was the recent publication of Frank Lloyd Wright and San Francisco, by NCCSAH board member Paul Turner. Emeritus Professor of Art at Stanford University, Paul provided informed commentary throughout the day. Our first stop was the 1937 Hanna House, also known as the Honeycomb House, because Wright based his design on the form of a hexagon. After a Stanford-hosted lunch, the group traveled to a house in Atherton inspired by Wright and designed by Anshen and Allen (1950) as the personal residence for developer Joseph Eichler. We learned of Eichler’s profound interest in the famous American architect during our visit, next, to the Wright-designed Bazett-Frank House (1940), in Hillsborough. Eichler lived in the house as a tenant, early in the 1940s, and so admired the architect’s work that he wondered if a modern house such as this could be built for “ordinary people”. Out of this thought grew a twenty-year career as a tract-home builder of the, now much sought after, “Eichlers”.